Steve Largent was about to break the all-time record for receptions in consecutive games. Every Seattle television station was on hand to cover the unveiling of Sanford Holien's dramatic painting commemorating Largent's magnificent career. Limited to 1500 lithographs plus 150 remarqued artist proofs. 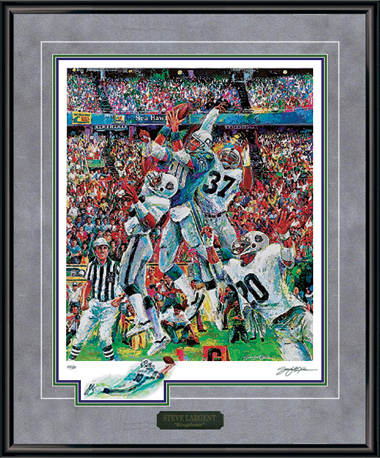 Each print features an original pencil-signed autograph from Steve Largent. Artist signed and numbered with a personalized Certificate of Authenticity. Lithograph size: 24" x 30"
Overall framed size: 31" x 38"